Einstein was working on something curious when he died, and many mathematicians went back to the last two blackboards that he was working on, to try to disprove what he had found (he had been trying to disprove it himself). What he had found was that there appeared to be a particle faster than light; such a particle ought not to exist, but his equations seemed to indicate that it did. Eventually, a mathematician named Feinberg, having failed to disprove Einstein’s maths, proposed the concept of tachyons. Tachyons are theoretical subatomic particles that run faster than the speed of light, and they are a theoretical particle that quantum physicists hate because if they go faster than the speed of light then they can’t measure them. If you tried to set a computer to measure them at 12 o’clock it would have to run backwards towards 11.59 because they would get there faster than the speed of light. But think about this: everything we receive from God comes to us faster than the speed of light. Our future, prophecy, words of knowledge, words of wisdom, it all comes to us before it actually happens. Two-thirds of the Bible is prophecy, God speaking before it happened. Feinberg made this statement: ‘Einstein’s equations prove that at the speed of light an electron is present at all points across its trajectory’. In other words, if an electron moves from one place to another at the speed of light, it is present everywhere along that path, all of the time. Now, we know that God is present, everywhere, all of the time. We call it the omnipresence of God. That means he is present all the time in our lives, past, present and future. As Jesus said, ‘before Abraham was born, I am’. 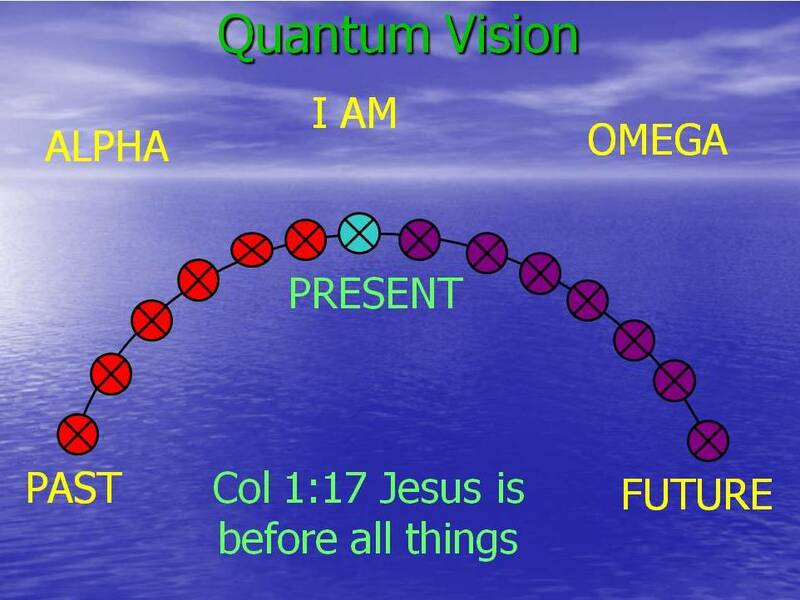 Jesus is the Alpha and the Omega. He was there before your life started, he called your life into being, he will be there all through your life and he will be there at the end of this physical life, though because we are eternal beings we will never end. So Jesus is here in the present, he’s here with us today, and he wants to engage with us on a daily basis every minute of every day. That means we can have a relationship with him which is intimate and real, and can have fellowship with him in which we are communicating and hearing his voice and seeing what he is doing all the time. But we have a past. How many of us have things in our past that we don’t like? Most people do. How many of us are still dealing with some of those things? Again, quite a few. Therefore we need Jesus to be operating in our past. But because he is omnipresent, of course he can. He’s there: to him it’s still ‘now’. Those of us who are familiar with Liebusters have seen this at work when Jesus reintegrates our ‘stuck’ parts. You can engage your past with Jesus so that he can heal you and restore you and set you free, release you from captivity, and bring everything into the present of where He is. Now, can you really grasp that? Everything that has happened in your past, he is present in it, because in the spiritual realm it’s all ‘now’. Jesus can change things, because he is present in your past today. There is nothing he can’t heal or restore or make whole. It’s really important for us to know that there’s nothing he can’t do. He is present in our present. He is with us, we walk with him. He is also present in our future, and he wants to reveal our future. Jesus is before all things, past present and future, and we can be connected to all three, through him. So nothing in our past can hinder our future if we surrender it to God. Introduction to Liebusters – Jonathan Cavan (YouTube clip). Second of two really useful re-blogs re prophecy and time, especially on the Lord’s ‘always now’ nature. I remembered an old chorus taken from that verse and sang it and meditated on it all day with a Spirit given awareness that I am one of those tabernacles. Then I found out after that… lo and behold , its the Feast of Tabernacles this week.